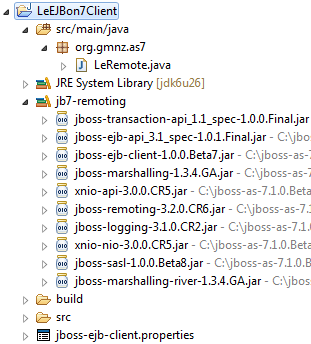 I'm trying to carry out some simple experiments in accessing an EJB's remote view from a client. 00:09:39,674 INFO [org.jboss.as.server.deployment] (MSC service thread 1-8) Starting deployment of "LeEJBon7.jar"
00:09:39,724 INFO [org.jboss.as.server] (DeploymentScanner-threads - 1) JBAS018559: Deployed "LeEJBon7.jar"
RemoteAdder adderEjb = (RemoteAdder) context.lookup("ejb:" + appName + "/" + moduleName + "/" + distinctName + "/"
Can't really figure out what's wrong. Your client side seems to be using and lower version of remoting jars (CR6) compared to what's there on the server (CR8). Which server version are you trying this against? Make sure you have correct version of all jars on the client side. Thanks to your hint I double checked the jar versions. Just one last thing: although I get the expected results from the remote invocations, is it normal to still have these messages on the server log? It looks like something that comes up when the client application exits. Should there be some sort of cleaning up to do before exiting the application? did you solved this Error ? Yes, this is fixed in 7.1.1.Final.